The Chipstead Village Fair & Flower Show are delighted to announce that the volunteers on the Chipstead Flower Show Committee have been awarded the Reigate and Banstead Mayor’s Volunteer Group Award 2017. 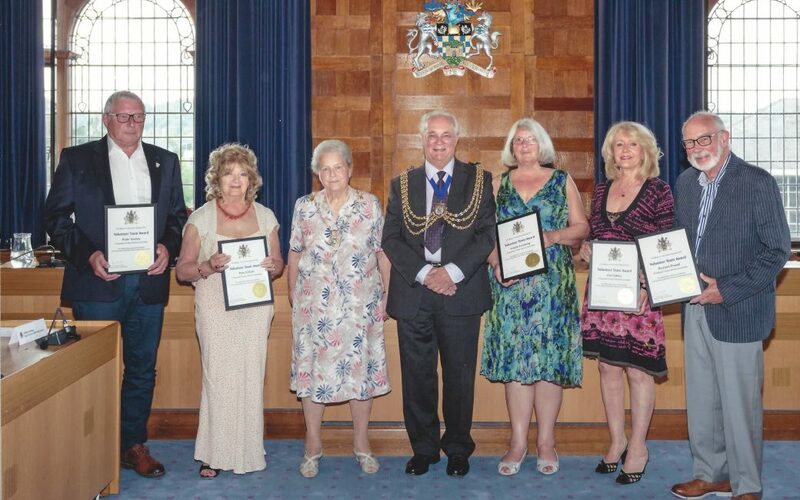 The award, given to residents of Reigate and Banstead Council who dedicate their time to helping others in the community, was collected by Peter Quiney, Pam Gilburt, Estelle Forsberg, Pat Oakley and Richard Powell on behalf of the entire committee. Two of the committee members were also given special recognition. Estelle Forsberg was recognised for her 31 years organising the vegetable, fruit and flower entries and Pat Oakley for her 26 years working with local schools on the children’s categories. The hard work of committee members past and present has ensured the show continues after 108 years; only war and a particularly wet summer in 2012 have prevented it. Their continued dedication solidifies the Chipstead Village Fair and Flower Show as a key event on the village calendar. We could not thank these volunteers enough and believe they are very deserving of this award. The Spitfire Display has been Cancelled due to CAA Intervention.